Learn what happens on-stage and behind-the-scenes in a pro company. 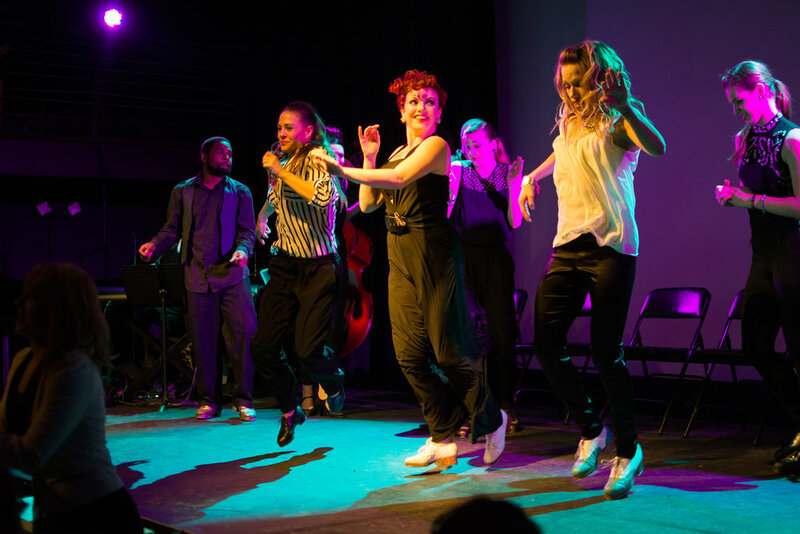 If you love tap dancing, come audition with us to see if you can take it to the next level - wherever you are in your development! Dance to perform as part of a group and in front of an audience. Our company puts on up to four shows each season and gets you the experience to dance with confidence when it matters most. Director, Meghan Way Stinson, along with RSTC Faculty, offer routines that shine onstage and give dancers choreography that makes everyone turn their heads. Be a part of something one-of-a-kind. Push your skills to the limit - and then go past them. You’ll face challenges in choreography, musicality, improv, & technique. If you’ve felt stuck in your current class, move up a level! As a dancer, teacher, and choreographer, I've been honored to have the opportunity to be a part of dance across the world. Still, I've never encountered a program quite like Rhythmic Souls' Performance Company. I'm so proud to have the opportunity to work so closely with our tap dancers. Our program breaks down the boundaries competitive dance too-often creates, while still encouraging the dancers to compete and train with their home studios. We offer real-life professional experiences like professional photo shoots, shows in theaters, music video participation, and the opportunity to learn historical and modern rep, and we do it in a setting where dancers feel welcomed and supported. We draw out each individual dancer's strengths, and help them find their unique voice on stage and in life. Rhythmic Souls’ Performance Company shows advanced tappers what it’s like to be a part of a real dance company. The curriculum is designed to expose dancers to all components of the stage experience, including sophisticated choreographies, challenging technique, how tech and lighting affects your performance, and behind-the-scenes access to some of Dallas’ top tappers. Dance side-by-side with experts and pros and fellow advanced performers.